One of the greatest lion tamers and animal trainers of all time was Clyde Beatty. He was a big game hunter who became famous as a lion tamer beginning in the 1930’s and often appeared in films and on television for the next thirty years. 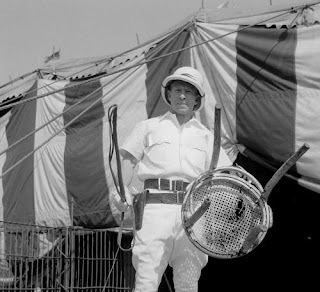 Standing only five & a half-foot tall, Beatty had the courage and mastery to go into a cage of 40 snarling lions and tigers with only a whip, a pistol and a chair. The whip and the pistol were used to get an animal’s attention, but many people wonder what good would a chair do against a wild animal? It turns out the chair is the most important of the three tools a lion tamer has at his disposal. The tamer holds the chair by the back and thrusts the legs towards the face of the animal. The cat tries to focus on all four legs at once. In the attempt to focus on all four, a kind of paralysis overwhelms the animal. It becomes weak and tame because of its divided attention. Lions and tigers are not the only creatures affected by this problem. We also tend to become unable to perform our duties when our attention is divided among too many things. Dear Lord we thank you for the life You have given us. We pray that we would keep our focus in life on You. In Jesus’ name, Amen.